Quinoa (pronounced KEEN-wah) is a grain crop originally from the areas surrounding Lake Titicaca in Peru and Bolivia. Prior to the arrival of the Spaniards, quinoa was a staple food of the pre-Columbian civilizations. Although quinoa was replaced by cereals after the Spanish conquistadors entered South America, it has since become one of the most popular and widely consumed health foods on the planet. Its reputation as a superfood is such that the Food and Agricultural Organization of the United Nations (FAO) singled out quinoa as a food with “high nutritive value” and deemed 2013 as “The International Year of Quinoa”. A one-cup serving of quinoa can deliver 15 percent of the recommended daily allowance of iron. 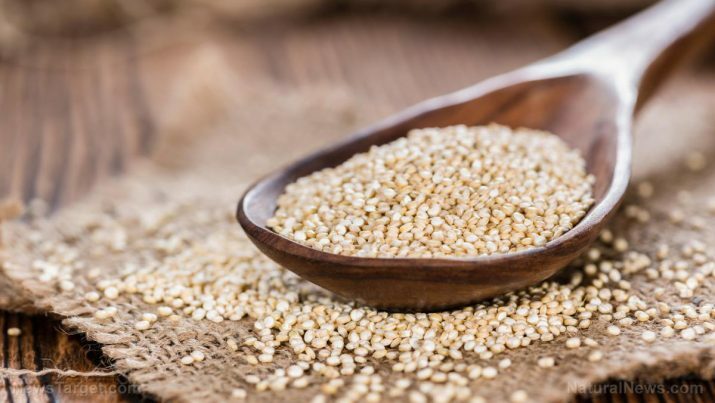 As one of the best sources of this mineral, quinoa can lower the risk of anemia. Folate, a nutrient that can assist the body in better iron absorption, is even more abundant in quinoa than iron. Together, they make quinoa one of the top foods for preventing iron deficiency. Quinoa is an excellent grain for bone health because it’s packed with magnesium. Similar to folate, magnesium is plays a key role in the proper absorption and metabolism of calcium. Quinoa has a low glycemic index of 53, meaning it’s a food that is good for blood sugar control and a top choice for diabetics. Quinoa is easy to incorporate into almost any diet. The simplest way is to substitute the rice part of a meal with quinoa. Since quinoa exploded in popularity, however, there have been countless recipes that have used quinoa as the prime ingredient or as an additional component. These range from quinoa pancakes to quinoa and chickpea burgers to quinoa porridge to vegetarian casserole. Note that quinoa has phytic acid, a substance that acts as a mineral blocker and inhibits proper absorption. Soaking or sprouting quinoa before cooking it will cut down on phytic acid. One other advantage of soaking is that it will rid quinoa of saponin, a mildly toxic substance that will make quinoa taste bitter or soapy. Quinoa is an excellent source of iron and can lower the risk of anemia. It is also rich in folate. The grain has a low glycemic index, making it an ideal option for diabetics.